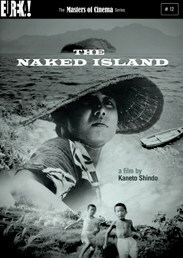 The Naked Island is a 1960 Japanese art movie which provides a snapshot of a year in the life of a rural family, witnessing their struggle to live and work on a remote island. There is no dialogue throughout and large swathes of the film pass in absolute silence, save for the occasional sound effects and sporadic music. I anticipated seeing the family struggle for survival, but when you see that the children are actually schooled on the mainland, and when there is a scene where the mother is collecting water from a ditch near some modern houses, you can’t help but wonder why they have chosen the life they lead, and why they don’t just move to the mainland. They seem resolutely stubborn in their battle to survive alone on the island, and at first it’s actually a shock that they’re living in fairly modern times and not Feudal japan! The time period is not fully clear until we see the mainland by comparison. The family’s day to day routine consists of collecting water and transporting it carefully at a snail’s pace on twin shoulder mounted buckets to the island for all manner of uses, including washing, cooking and growing crops. Spilling or dropping the water during the hours of exhausting back and forth journeys results in a swift back-hander across the face, as we soon learn when the husband punishes his wife in this manner for stumbling with the heavy burden after hours of back breaking work. Again, it does seem crazy with civilisation all around; shopkeepers, fishermen, teachers etc. You could understand it more if they were all alone miles from anywhere, which is what I must admit I was expecting; more of a remote island scenario. At times it seems a little like the story of the king who built his castle on the sand, trying to fight back the tide. Now, it might be ‘arty’ but I have to say that it is very very boring. To get an idea… I’m sitting in my kitchen eating a piece of toast. The camera is fairly close-up. I’m munching away and staring out into the garden, maybe for 10 mins. Then my wife comes in and makes herself some toast. We see her butter the bread and apply some jam. I look up at her, she looks at me, we don’t smile or speak, the only sound is the knife being placed on the work surface, she leaves the room, I go back to staring out of the window. All beautifully shot of course!! Did I see him smile at 20mins 50 or was that just a grimace? There is a scene where the two young boys are asleep, the husband is busy in the kitchen and the wife is washing herself in a makeshift bath / barrel while watching the sunset over the mountains. She looks generally content and you start to begin to understand what it’s all for. The surroundings are indeed beautiful. As the seasons change it’s time to begin toiling in the fields to harvest the crop they’ve been watering. 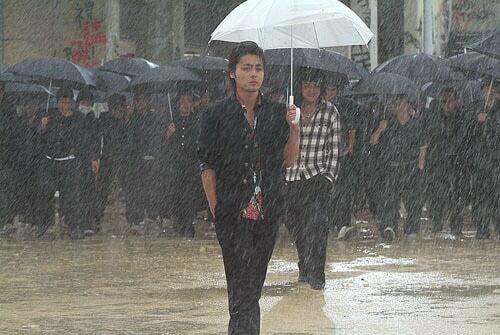 Then we see another glimpse of different aspects of their lives. An historic ceremony on the mainland provides a brief respite from the toil as they come across to the mainland, dressed for the occasion. We hear songs, see dancing and laughter as children get together, singing rhymes and poems. The section is uplifting. They also make a trip to town to sell their produce, and we get to see the fruits of their labour; they laugh and joke, buy new clothes, have a proper meal at a restaurant, they look happy and content as a family – a reward for the year’s hard graft. One minute they’re taking a cable car ride like a modern family, the next minute it’s back to the island fishing in the pouring rain! Then it all changes somewhat. One of the sons becomes ill and, despite a mad dash to the mainland by the father to fetch the local doctor, actually dies. A small funeral is held on the island with local people and local children. Even now they’re working ; mum and dad carrying the makeshift coffin between them. After the hustle and bustle and the last of the guests leaving, it’s back to the toil. The mother allows herself a brief outlet of emotion, falling to the ground with a scream, ripping up the crops, making the only sounds she’s made in the whole movie. Then their work resumes! It’s a strange film; a beautifully shot glimpse at one family’s gruelling struggle to work the land, living for the occasional reward and break from the monotony, and striving for something that’s become all encompassing, even after the loss of a family member they forge ever onward for something greater than they are. Thought provoking if tedious at times, and certainly not for everyone. The Masters of Cinema edition of The Naked Island is available now from Eureka. Full-length audio commentary by director Kaneto Shindo and composer Hikaru Hayashi, Video introduction by Alex Cox, Optional English subtitles, Production stills gallery, 24-page booklet with a new essay by Acquarello, and a reprint of Joan Mellen’s interview with Shindo from Voices from the Japanese Cinema. I’ve seen this and found the repetitive nature of it a chore to sit through too, but for me the events towards the end were incredibly powerful and brought the film back around. The tragedy made their endless toiling that much more fruitless and devastating. It’s certainly not a film for everyone and I won’t be rushing to watch it again, but it worked enough for me to have given it a higher rating if I’d have covered it.